AnOther’s Lovers resounding winner this week is a photo of a young Marc Jacobs, dressed to match his Dalmatian, Tiger. Our Lover of the week, Giulia Mutti, is clearly in tune with the zeitgeist of the moment. Not only is this her second week running as our AnOther Lover, but she started us off on the right note with her story “Fashion Dogs”, on fashion designers and their chic sidekicks, for our latest Happy Monday. We at AnOther love nothing more than a fashion icon with their four-legged friend, see our features on Valentino and his puggy entourage, or on Tom Ford and Richard Buckely’s Smooth Fox terriers, who also starred in A Single Man. This photo of Marc and Tiger has all the makings of a classic – Jacobs, long haired and smiling at 27, kneeled down next to his handsome companion, Tiger, nobly gazing into the distance – either he knows this moment is being recorded for posterity, or he just looking at someone in the sidelines holding a treat. At the time, Jacobs was still working at Perry Ellis – only two years earlier, when he’d started, no one even believed he was a designer there. "I remember the first day I showed up. I had a motorcycle. I pulled up and they said deliveries are around the corner," he said. In our photo of the week, Jacobs was just a couple of years off from launching the grunge collection that would cement his reputation, setting off a chain of events that would cause him to leave Perry Ellis and strike out on his own. 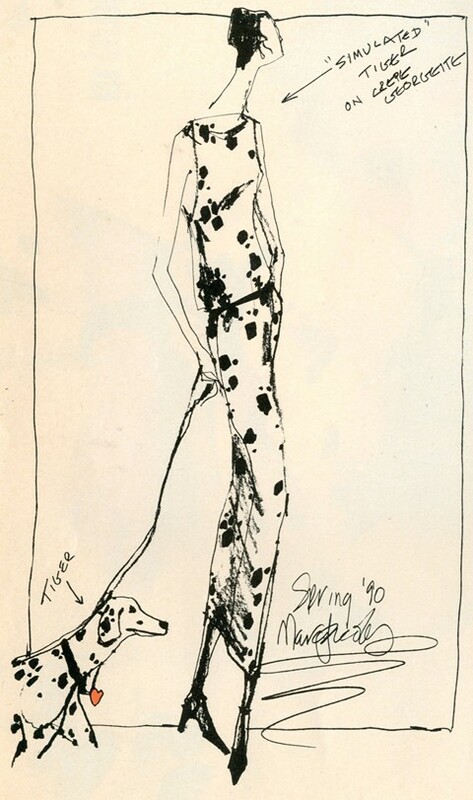 But even back then, Tiger wasn’t just arm candy for Jacobs – the Dalmatian inspired ideas for some of his early designs, like this spring 1990 sketch of a woman in a Dalmatian-printed dress, with Tiger drawn next to her, titled “Simulated Tiger on Crepe Georgette”. Tiger came from a long line of well-bred – Dalmatians used to be carriage dogs and would travel alongside horse carriages to protect their owners from bandits. Originally they were from the Dalmatia region of Croatia, where they were guardians to travelling nomads, and the first ever recorded Dalmatian is in an alter painting in a church on a small island in Croatia, dating back to 1600. It wasn’t until the early 20th century that Dalmatians became hugely popular in Europe, and then they really took off – Picasso, Ginger Rogers, Wilhelmina Cooper and Marinanne Faithful all chose Dalmations as pets (see the gallery), perhaps Jacobs took inspiration from them. Jacobs’s later dogs are as likely to go down in history as Tiger. These days, the designer is never far from Neville and Daisy, two black and white bull terriers. Daisy is named after Daisy Buchanan from the Great Gatsby, and has been immortalised by Jacob’ iconic fragrance, Daisy. Neville has his own Instagram account, with 145k+ followers, and posts a lot of selfies, namely of him in the car, napping in the sun, and hanging out with his doggy pals. 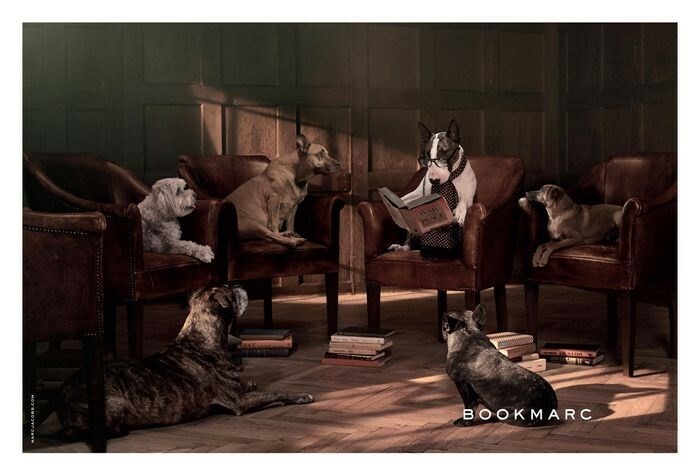 This year Neville has also been cast in the Bookmarc campaign, with the photos shot by David Sims. Neville, wearing a pair of glasses and a tie, reads War and Peace to a host of canine companions listening with rapt attention. To get to the bottom of our doggy love affair, we spoke with Mutti about why she’s a dog person, the cinematic importance of Lady and the Tramp, and why next Halloween, we might see her as a German Shorthaired Pointer. Why did you love this photo of Marc in his Dalmatian outfit, with his dog? 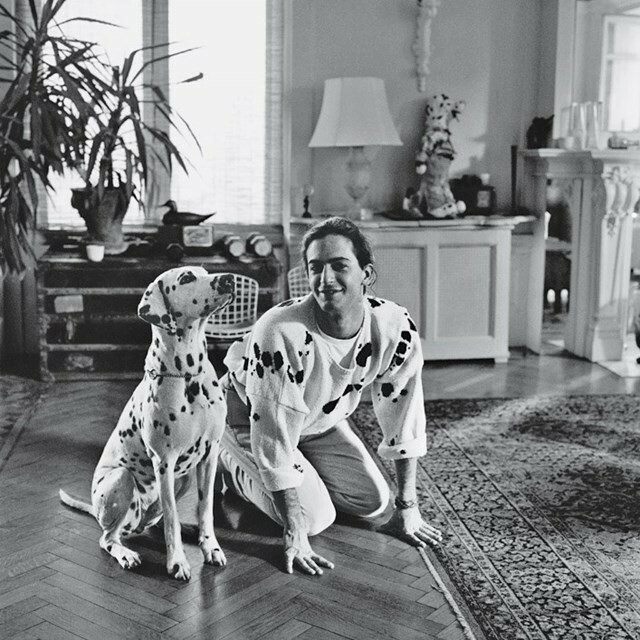 I’ve always liked Marc as a designer, but this photo makes him feel more human – it’s just a man and his dog, except that man happens to be Marc Jacobs in a Dalmatian outfit and that makes me happy. There’s something innocent and playful about it, something that anybody who’s ever had a dog can relate to. What would you do with this photo if it was yours? I’d get it printed on white T-shirts and make millions. Favourite dog moments in popular culture? There’s a lot of them, but the one that has always stuck with me is the scene in Lady and the Tramp where they kiss over a bowl of spaghetti and Lady falls in love. Dog person, hands down. We always had dogs while I was growing up, but recently we rescued a kitten from the street and nursed him back to life - I never thought I’d like cats so much but that little guy made me change my mind. Did you have a dog growing up? Yes, her name was Penny and she was a white, short-haired tiny mongrel. I was four-years-old and remember begging my mom to get her, she was adorable and I had to have her. My best memory of her is her first winter when she ran out into the snow to play with me and disappeared because she was so white, you can barely notice her in those photos. If you could dress up as any dog, which one would you choose? A (blue-eyed) German Shorthaired Pointer. Dressing up dogs, good idea, terrible idea? Let’s just say it’s not my cup of tea. A nice collar is one thing, but a pink tutu is a bit much in my opinion. What’s your favourite Marc Jacobs piece? My black grained leather zippy wallet. For the first time I’ve had a wallet that actually holds everything I need – it’s simple but well-designed, one of those pieces that you’ll never grow tired of. What’s your favourite fashion designer dog moment, other than this one? 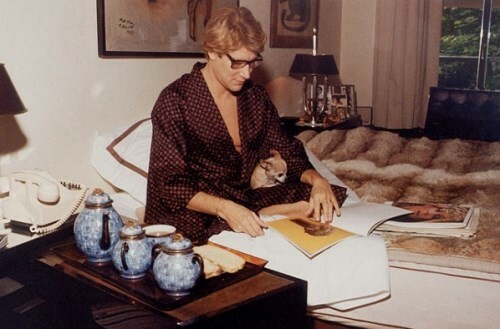 A photograph of Yves Saint Laurent reading in bed with his Chihuahua snuggled up in his night robe. It feels very honest and I love the seventies styling and colour.